Luchino Visconti (Ossessione, Death in Venice) and screenwriter Cesare Zavattini (Bicycle Thieves) open the film with The Witch Burned Alive, about a famous actress and a drunken evening that leads to unpleasant revelations. Civic Sense is a lightly comic interlude from Mauro Bolognini (The Lady of the Camelias) with a dark conclusion, and The Earth as Seen from the Moon sees Italian comedy legend Totò team up with Pier Paolo Pasolini (Theorem) for the first time for a tale of matrimony and a red-headed father and son. 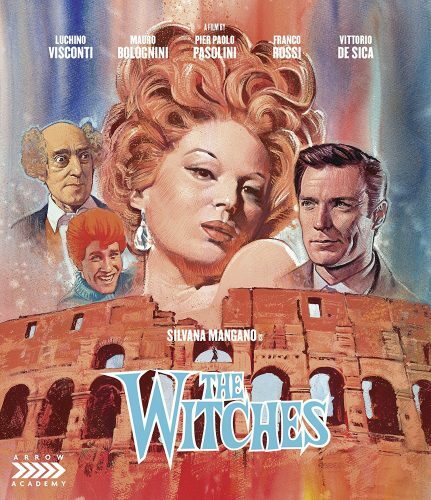 Franco Rosso (The Woman in the Painting) concocts a story of revenge in The Sicilian s Wife, while Vittorio De Sica (Shoeshine) casts Clint Eastwood as Mangano s estranged husband in An Evening Like the Others, concluding The Witches with a stunning homage to Italian comic books. The Witches is a film that showcases 5 short stories dealing with women in society. The story’s deals with Jealousy, lust, a woman looking for husband to be more romantic, and even a father and son who are looking for a new wife and mother which turns out to be the most odd wacky story line. The story’s are good at bits and one story turns odd in a comedy genre and it gets somewhat slap-sticky. I went into the is film not know its 5 short stories and thought Clint Eastwood would have a bigger role. The story he is in is fun but his role is on the boring side which that’s what he is supposed to portray as a husband that isn’t as romantic as the wife would like him to be. Overall the if sound the some of the sorts are kind of dry and boring at times but it does have two story’s I thought were OK the first one and the last one. Sadly this movie gets low reviews and I’m on that side as maybe I wasn’t in the mood or maybe I’m correct in my rating that this film could use work. With that said I give this film a 2 out of 5. It has its moments in the first and last story’s but the whole middle for me was a miss. On a Bonus side of things, as an extra we have a shorter English version of this movie but it’s not remastered. I say give it a shot if you’re a collector of Arrow Academy but if not I say read more reviews.